The Outlaw Josey Wales is a 1976 revisionist Western film set at the end of the American Civil War directed by and starring Clint Eastwood (as the eponymous Josey Wales), with Chief Dan George, Sondra Locke, Bill McKinney, John Vernon, Paula Trueman, Sam Bottoms, Geraldine Keams, John Russell, Woodrow Parfrey, Joyce Jameson, Sheb Wooley, John Quade, Will Sampson, and Royal Dano. 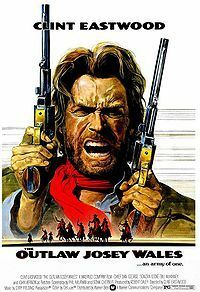 The movie was adapted by Sonia Chernus and Philip Kaufman from the novel The Rebel Outlaw: Josey Wales (republished in 1975 under the title Gone to Texas) by Forrest Carter. In 1996, this film was placed in the United States Library of Congress and selected for preservation in their National Film Registry. This film is considered by many enthusiasts to be one of the greatest westerns ever made, including the late Johnny Carson and Eastwood himself, who has been quoted as saying that The Outlaw Josey Wales is his favorite of all the movies he has made.